Step right up, step right up! A fair is not complete without the amusement rides. Who isn't thrilled to ride on the Tilt-a-whirl, Merry-go-round, Ferris Wheel or the fast moving Roller coaster? Your Challenge is to create a card that spins, rolls, swings, or jiggles. There are a lot of YouTube videos describing these techniques and I have attached several of them below. In my example, my box card contains a Ferris Wheel that spins by using a simple brad. Here is a Spinning Card - So Cute!!! Have fun everyone, cards that move, wiggle and spin are such a delight to make and because of their interactive nature bring such joy to the recipients. 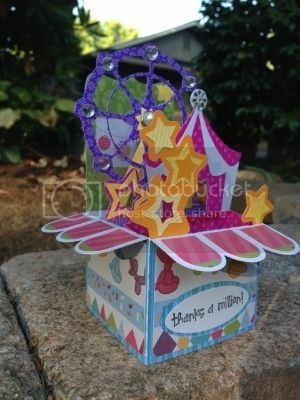 I hope you try one of these techniques or just make a card that contains an image of a carnival ride! You have until midnight on Tuesday to complete the challenge and post a picture of your creation. I will randomly choose someone that has tried this and posted a picture of their creation to receive a prize from me. Last edited by Prince of Paper on Wed Aug 12, 2015 7:32 am, edited 6 times in total. WOW Barry, that is really spectacular! Fun challenge too! Wow Barry what a fun card!!! LOVE it!!! I hope to give this a try. OMG, Barry, your card is amazing!!! You are really setting the bar high. I will look at the tutorials and see what I can come up with. This is a super fun challenge. My card offers a spinner! I have never done one before! Yay for new things! I thought of Sheri while I was doing this card. All this glitter would have given her an anxiety attack! For one with such a sparkling personality, I find that funny! The inside says "You're a Winner!" Marilyn, this is terrific! I love the rainbow card and the sentiment is awesome to go with it. Thanks for taking a ticket to ride! Very cute idea and execution, Marilyn! Barry, I love your wonderful card! Marilyn, that is lovely with all those bright colors and the wonderful sentiment. Crud, the circle card I made yesterday has 2 pieces that spin. However, that is my circle/ferris wheel card. So, to think of something different for this one. Awhile back I bought a whole bunch of Action Wobbles and stashed them...this is the perfect challenge for them! The Wobble pieces were so large and would show, so I added the wobble under the black background. Unfortunately, I got glue inside the wiggle eyes hence the wacky expression! Last edited by Trudeenr on Sat Aug 08, 2015 10:35 pm, edited 1 time in total.